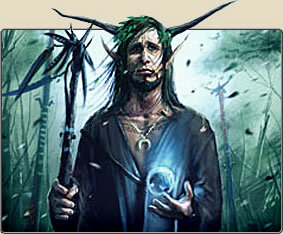 The Sylvan have been at peace for millinea; woe betide those who would draw them to war. In ancient times, the Elf-queen Seirowyn planted the first seeds that would become the Mother Forest Kithil�aa, from which the Sylvan peoples hail. 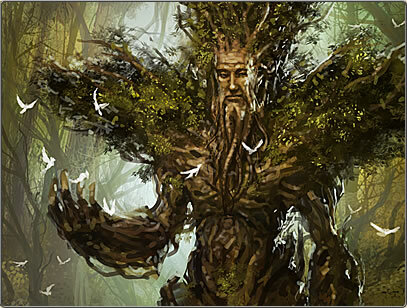 The Sylvans live in harmony with nature; their cities are akin to great gardens and groves of venerable trees, their lives are spent cultivating and culling as needed by the primal balance of life. 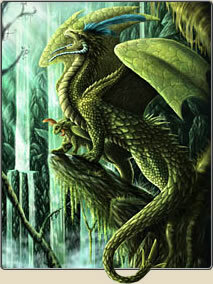 Overall, the forest of Kithil�aa is kept at peace by this devoted service, as no ill-willed intruder has ever survived a night among her trees. Most strongly represented by the swift and stealthy Elves but comprising a host of woodland creatures, spirits and strange beings, it could be said that a Sylvan army acts as a spearhead of the natural world. Their warriors are quick, keen and sure, striking at distance or closing with foes at great speed; and their healers and mystics draw upon the inexhaustible power of Kithil�aa to bolster their own ranks, overwhelming and confounding their foes. They move in stealth and appear without warning; any tree could be a soldier, any innocent songbird a spy, and any whistling breeze an arrow through the heart.